Open Text said it’s a done deal. The planned acquisition of all of the issued and outstanding shares of Vignette (worth approximately US$ 321 million) has been completed late yesterday following a shareholders’ meeting where the voting and approval took place. While Vignette is busy nostalgizing, Open Text says it’s working on the strategic aspects of what may come next. Let’s not forget that Open Text already has a WCM-centric group called Open Text Web Solutions. Offering an even broader range of (quite similar) products is going to take some brain activity. Then again, this would not be the first quilting exercise for Open Text. In the meantime, there’s still some Vignette cash to recognize on OTEX’s balance sheet. According to the “big brother,” support will continue for Vignette’s products and (the relatively quickly decreasing) installed base (bringing in the licensing revenue). The same applies to existing Web Solutions products and customers. No comment has been made in regards to new(er) Vignette products. Vignette’s social media, DAM and personalized content seem to be some of the most palatable notes in this content management connoisseur combo. Open Text also expressed intent to potentially leverage some of Vignette’s components in its ECM Suite. More details on the product strategy and the product roadmap are not likely to be announced earlier than October, when Open Text’s annual conference — Content World 2009 – will take place. Restructuring is expected. We should know more about the range of that initiative around the end of August. Open Text watches this trend closely and acts accordingly, in its true “candy and aspirin” fashion. Today, the vendor has announced a new addition to the Enterprise CMS platform — Open Text Social Media, which may help conservative organizations to (safely) warm up to social media. Now Open Text’s Scott Welch co-founded SoftArc Inc., which started developing and shipping FirstClass in early 90’s. In 1999, SoftArc merged with MC2 Learning Systems to form Centrinity. In addition to Centrinity’s platform, Open Text Social Media is also tied to what used to be called Livelink — Open Text’s collaboration and knowledge management product— using it as the main repository. Web services technology and proprietary APIs were leveraged to tie in the existing platforms. The new software can, naturally, be integrated with Open Text’s own records management(RM) and archiving products as well. One of the final sessions at Gilbane SF yesterday was around content standards: CMIS, JSR-170 and JSR-283. Many realize there are several challenges with CMIS in particular and efficiently working with content from disparate content repositories in general. The session aimed at shedding light on some of these challenges and possible solutions in the standards space. Chances are, if you’re in the enterprise content management space and you have an ECM system, this still doesn’t solve all your ECM problems. There are also document management and digital asset management systems, for example, you need to be able to “talk to.” Users of one ECM system often need to access and store documents in an entirely different content repository. Scattered data repositories only add to the challenge. The majority of companies have an assortment of repositories, be it ERP, PLM, PDM, BI, KM, WCM, or DM systems. The problems we run into with multiple repositories are compliance, eDiscovery and business intelligence. Add to that the fact that 80% of data is unstructured, and the enterprise world looks very gloom. Search gets harder as data sets grow. It takes longer to index. Thus, it takes longer to search. Naresh Devnani, managing director at Lean Management Group, gave us a peek into real-life scenarios and impressions of implementing a standard’s wrapper, from the times when he was working for Vignette PS. Devnani talked about implementing a JSR- 170 (the standard that was led by Day Software) level 1 functionality for an RDBMS-based web content management system. One of the examples at the session was quite shocking, actually. According to Devnani, some customers think of interoperability in terms of a content migration and moving things around from one repository to another. But there are still high hopes for CMIS. One of the most anticipated sessions here at Gilbane SF was the Keynote Industry Analyst Panel moderated by Frank Gilbane. Unsurprisingly, the panel revolved largely around all things social media. LW: I agree that we should be user-centered. The challenge has been is that we can’t do it. One of the biggest things that people are ignoring is the revolution in product development that grows from paying attention to quality. What are your quality controls like? Are you measuring for quality? JO: The biggest finding in a recent Forrester research indicates that every page on the web will soon be socially ranked and rated. Google Chrome will get some social features. You can’t stop it. The social movement is happening, and you better damn well embrace it, have a strategy and do it right. JO: The reason we see so much fear when it comes to social media in the enterprise is due to the lack of strategy. Technology is only 20%, while strategy (roles, process, governance, measurement) is the other 80% of the objective. LW: The number one disengage with social media in the enterprise is lack of engagement and guidance at the executive level. LH: Social media is about the innovation process. Dell.com’s Idea Zone, for example, is used to attract ideas on how to improve products. Dell uses this social aspect to supercharge their innovation process and improve the flow of ideas. LW: ’Cuz I gotta say web governance at some point today… You really can’t control real-time collaboration. This should really be post-dated to early May. I wrote this one up while one my 10-hour flight to Moscow and then had barely any access to the Internet. I wasn’t very impressed with Cartella. Even though, Ingeniux is trying to catch the soco, so. media/networking train (which is a nice development in itself). What does Cartella do? 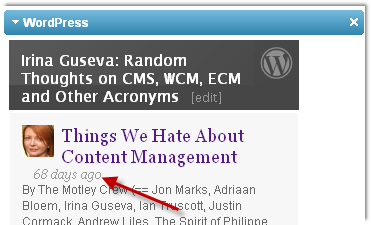 The very basics of social networking, social content and web content management put in the same wagon. I talked to Ingeniux’s David Hillis, director of marketing and business development, and Nathan Eggen, director of technology – and this is what I’ve found out. Really worth a read, if you’re in the SaaS CMS space or looking to be in it.